Magical yuletide markets, grottos, light shows and craft workshops will be on offer at the Treasure Houses of England – a consortium of historic estates including Beaulieu, Blenheim Palace, Burghley, Castle Howard, Chatsworth, Harewood House, Hatfield House, Holkham Hall, Leeds Castle, and Woburn Abbey. Beaulieu – Step back in time to 1889 to join the Montagu family, played by costumed actors, as they rehearse a Christmas Day pantomime and visitors are invited to join them on stage. Then join Lady Montagu in the Library for craft activities to make your own Christmas card or sparkling tree decorations. Meet Lord Montagu’s cook as she prepares the Christmas feast, see a Christmas tree in every room and enjoy carols and punch by the fire. At the entrance to Beaulieu, take your photo with the life-size gingerbread house before following the magical path lit by fairy lights down to Palace House. The event runs on December 9th -10th and then from December 16th-January 1st. Please note the attraction will be closed on 25th December. Blenheim Palace – Marvel as Blenheim Palace’s Formal gardens are lit up in a rainbow of colour during an unforgettable after-dark festive trail of lights. The lake will be aglow with brightly-lit boats and dancing fountain jets, the arbour will be adorned with fairy lights, and fibre optics will transform the hedgerows – helping to create a magical wonderland. The event runs from November 24 – January 1. Closed 25th December. Burghley – Food markets with a difference! Come and meet over 30 local suppliers at Burghley’s biggest ever 4 day festive celebration of local produce. With handmade cheeses, artisan breads, organic vegetables, luxury sweet treats and rare breed meats. In the Courtyard from 9am to 4pm onThursday 23rd November – Sunday 26th November. Free admission. Castle Howard – A host of angels will descend on Castle Howard’s grand state rooms to spectacular effect in Angels on High – set to be particularly special during candlelit twilight visits over the weekend of December 16 and 17. Throughout the festive season, 18 November – 23 December, visitors will be treated to live music around the house, seasonal menus, lit fires, indoor markets and Christmas goodies in the shop. 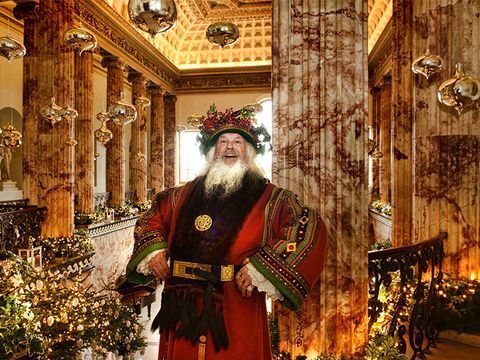 For younger visitors, there will also be a Magical Christmas Garden, Audience with Father Christmas, Enchanted Evening with Father Christmas, a soaring Christmas tree and the return of Bompas & Parr’s Gingerbread Castle Howard. Chatsworth – Fagin and Miss Havisham will be at the centre of a Christmas Carol-themed event called Oh Dickens, It’s Christmas, but there will be no lack of festive spirit at Chatsworth as actors don authentic costumes for a special show. There will also be Christmas markets, twilight evenings and a masquerade ball. The event takes place from November 11 – January 7. Chatsworth is closed on 24, 25, 26 December 2017 and 1 January 2018. Hatfield House – A Christmas Frost Fair will feature up to 200 stalls of exciting gift ideas, as well as a fine food fair and displays by craftsmen and women. Activities take place at various locations around the grounds from November 16-19. Holkham Hall – Opulent Christmas decorations and beautiful flickering candlelight set the scene in the state rooms of the magnificent hall for Holkham’s Candlelight Tours. A two-day Food Fair, Diva Opera Christmas Show and festive craft workshops will put you truly in the festive spirit. Leeds Castle – Discover the ‘Traditions of Christmas’ from the origins of Christmas cards and crackers to poinsettias as you make your way through Leeds Castle’s State Rooms from November 25 to January 1. Browse an array of seasonal gifts, toys, festive decorations and specialist food and drink at the Leeds Castle Christmas Market, with nostalgic fairground attractions and real reindeer, weekends from November 25 to December 17. Closed on the 25th December. Woburn Abbey – Are you looking for a unique Christmas gift for your loved one? Treat them to a study day or event at Woburn Abbey. Woburn Abbey have a range of fantastic experiences to choose from next year, a range of gardening study days, spectacular carriage tours, a behind the scenes tour with Housekeeper’s Know How, a selection of themed guided walks and many more.